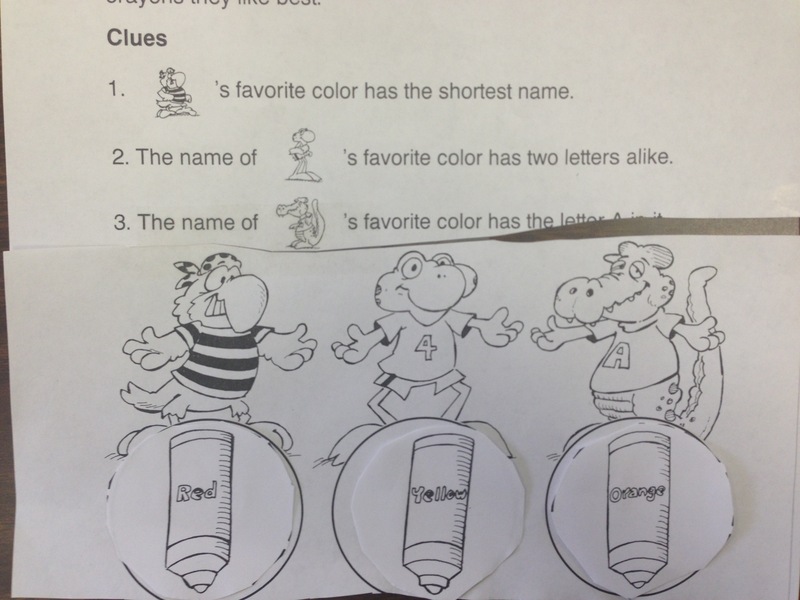 My GT Kindergarten students are learning about “Detective Thinking.” This is when one uses clues to find a right answer. (This term is taken from the book, Primary Education Thinking Skills, Volume 1.) One of the hardest concepts for students to grasp at this age when we do “Detective Thinking” is the importance of not jumping to conclusions. For example, we did an activity where I described a “mystery animal.” They were supposed to deduce and draw an animal based on the clues I gave. One of the clues basically stated (and I’m paraphrasing), “it flies, can turn its head nearly all the way around, and it is forever asking one question.” One student drew a falcon. When I asked her why, she said, “Because it flies.” When I asked her if the other clues describe the falcon, she just shrugged. One clue fit, and that was enough for her. Yesterday, we did a logic puzzle. I’ve included the picture of one student’s paper above. This was her corrected paper. Originally, she had the orange crayon beneath the frog. She was the only student who did it incorrectly. As you can tell from the fact that I had to piece together her paper with tape, she had earlier had a problem following directions about what part of the paper she was supposed to cut with her scissors. When I saw the wrong answer, I figured this was another case of not following directions. “Can you tell me why you put the orange crayon under the frog?” I asked her. She pointed to it, and then read the clue to me. “Which two letters are alike in that word?” I asked. “‘R’ and ‘g’,” she replied. I then explained how the rest of us had interpreted, “two letters alike,” and why “yellow” fit that clue better. Later on, I realized that I had almost been a conclusion jumper myself. If I hadn’t taken a moment to find out more about the student’s thinking, I would have corrected her and moved on – assuming incorrectly that her mistake had been another result of inattention. We are so often in a rush to fix mistakes when we teach that we sometimes miss these valuable conversations. As I wrote last week, the real sources of problems often elude us when we don’t ask enough “why’s” and end up trying to solve the wrong problem. Sucha great reminder. I do an activity with them for transitions where I give them 3 things that have something in common and they are supposed to continue the list with things that belong in that category. Very often they will say something where my first thought is the answer is wrong, and then they explain why and it is a way of thinking I never would have thought of, but it makes sense! They can surprise you sometimes.